Despite a study in February 2012 indicating that Wikipedia pages appear in 99 per cent of Google's page one SERPs (search engine results pages), a more recent report has claimed that the correct figure is closer to 46 per cent. However, Google is still apparently fonder of the online encyclopaedia than Bing, via which Wikipedia only appears 31 per cent of the time, when using the same criteria. This is not only revealing about the relationship between Google and Wikipedia, but also about the differences between Google and Bing, as 15 per cent is quite a significant margin. The new research has come from New York-based SEO technology provider Conductor, which organised a set of 2,000 keywords into informational and transactional categories, then distributed them using a keyword query length methodology by website traffic monitor Hitwise. Complete search results were monitored alongside page one results, with the conclusion that 64 per cent of the time Wikipedia does not appear at all in Bing results, compared with 29 per cent in Google. However, in terms of prominence, the ranking statistics for Wikipedia are more favourable in Bing than in Google. This is because of all Bing's Wikipedia results, 86 per cent appear on the first page; whereas of all Wikipedia results in Google, only 65 per cent are on the first page. 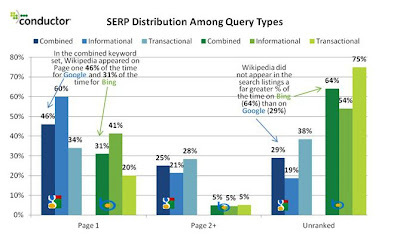 Furthermore, Wikipedia's page one results are more likely to appear in Bing's top three than in Google's top three. The former showed a result of 83 per cent, compared with 65 per cent for the latter. Industry experts are quick to point out that the approach to keywords can differ wildly between one SEO survey and another, producing very different results. "Conductor compared 2,000 informational and transactional keywords of varying word lengths," said Matt McGee of Search Engine Land. "Navigational keywords were not included because Conductor found very low Wikipedia visibility for those types of keywords." He added: "Conductor also removed one-word queries from its study and found that, overall, Wikipedia appeared about 10 per cent more often on Google’s page one than on Bing’s page one." The fact remains that Wikipedia has a very generous slice of the SERPs pie from both Bing and Google, with the former at nearly a third and the latter nearly half. Along with other popular websites such as 192.com and Amazon, this narrows the field for smaller brands fighting for prominence. It is therefore very important that businesses select their keywords carefully and steer clear of those which are too broad or generic. Knowing your target audience and understanding what they are seeking will help you to devise a more precise range of effective search terms, making it easier to connect with your potential customers.